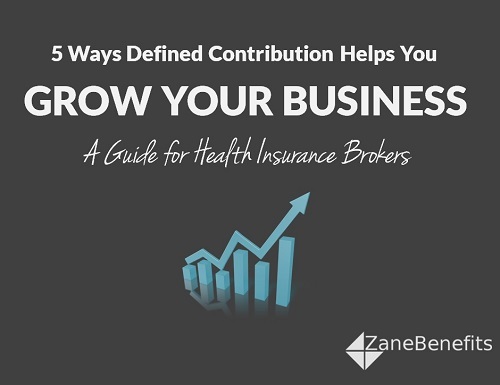 Zane Benefits, which provides small businesses with simple and friendly healthcare solutions, announced today the publication of a new eBook “5 Ways Defined Contribution Helps You Grow Your Business”. The new guide outlines five ways brokers use Defined Contribution to thrive in the changing insurance landscape. According to Zane Benefits, the small business health insurance market is undergoing a major transformation. Small businesses are canceling group health insurance because of cost, participation requirements, or more affordable options on the individual market. Additionally, there are 2.3 million U.S. small businesses who don’t offer health insurance, largely because of cost. According to Zane Benefits, these small businesses are looking for more affordable ways to offer health benefits, and they are turning to health insurance brokers for alternatives. The emerging solution? “Pure” Defined Contribution Health Plans, used to reimburse employees for individual health insurance. By offering Defined Contribution, brokers can retain clients canceling group health insurance, access an untapped market, and grow their business in 2014, 2015, and beyond.